Formation of postsynaptic specializations requires the positioning of a huge macromolecular complex, the postsynaptic density, at the tip of the dendritic spine. Assembly of this protein complex is enabled by tight control of intra- and intermolecular interactions between PSD scaffold proteins. In parallel, rearrangements of the actin cytoskeleton are necessary to generate a spine and bring it into its mature form. Actin treadmilling in spines is controlled by small GTPases of the rho family via a range of downstream effectors, including PAK, WAVE, and IRSp53 proteins. Aberrant spine formation is a hallmark of the pathology of inherited forms of mental retardation (MR), and proteins of the rho G-protein cycle are mutated in specific forms of MR. 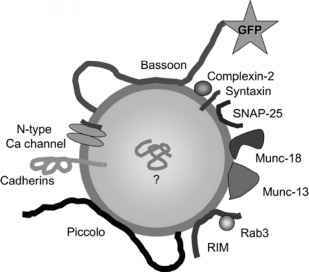 In addition, the loss of the RNA-binding protein FMRP in patients suffering from fragile X MR syndrome suggests that translational control at or near synapses may also contribute to the correct assembly of the postsynaptic apparatus.